CULLMAN – Cullman County Sheriff Matt Gentry often refers to it as the “heart and soul of the sheriff’s office.” On Thursday morning, the Cullman County Sheriff’s Office (CCSO) kicked off the annual Jimmy Arrington Memorial Rodeo with a mini rodeo for the county’s special needs community. 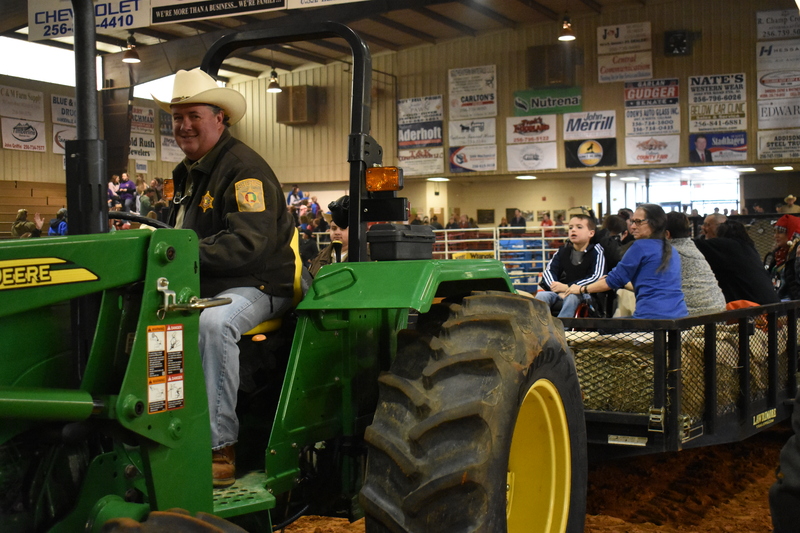 More than 1,000 attendees filled the stands at the Cullman County Agricultural Trade Center, while hundreds of community volunteers and CCSO deputies came to help, many of them volunteering off-duty hours. The mini rodeo featured exhibitions of events like calf roping for men, break-away roping for ladies, team roping, bull riding, and ladies’ and juniors’ barrel racing. While it was an exhibition, the participants were the real thing; the upcoming pro rodeo is sanctioned by both the Professional Cowboy Association and International Professional Rodeo Cowboy Association. The other sheriff, “Sheriff Woody,” and veteran rodeo clown “Dusty” kept the crowd laughing, cheering and generally fired up. After the regular rodeo events concluded, the arena floor opened to the audience. Students, assisted by volunteers and rodeo staff, barrel raced on stick horses, tried their hands at roping dummy calves and took hayrides in wagons pulled by deputy-driven tractors. At every step, deputies and volunteers lent helping hands to make sure that students’ limitations wouldn’t limit their fun. Every public school in the county system sent its special needs students, along with some students who even made the trip from Winston County. For professional clown Dusty, the special needs event is the highlight of the three-day rodeo. The pro rodeo takes place Friday, Dec. 7 and Saturday, Dec. 8. Gates open at 5:30; events start at 7:30 both nights. The Cullman County Agricultural Trade Center is located at 17645 U.S. Highway 31 N, Cullman, Alabama 35058. Previous articleCOLLEGE VOLLEYBALL: Wallace State volleyball’s Lexie Riggins earns NJCAA Division I 2nd-team All-American recognition.